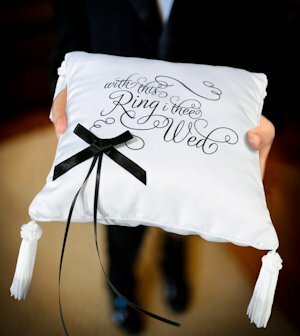 Your ring bearer will proudly tote your rings down the aisle on this elegant white satin ring bearer cushion. The pillow cushion features the words "with this ring I thee wed" in a scroll design. Under the words on the pillow is a black satin bow with black ribbons and each four corners of the pillow have white tassels. The contrasting black and white in the pillow make it a stunning accessory piece that is sure to be noticed. It measures 8.25".